Recently I was having issues with Spotlight hanging when trying to index the HD on my 2012 15" Macbook Retina laptop. Spotlight never finished and in conjunction I noticed that I hadn't had a successful backup in over a month. When I kicked off a backup manually (Backup Now), the backup would get to the 1.62GB or 2GB point and just *stop*. I took it to the Apple store, the tech did a permissions repair and disk repair on my SSD, no issues were found. I did the same system checks on the external drive I use for backups. No problems found with the external drive either. The tech recommended reinstalling OSX, but I couldn't do that until I had a good backup. I took the laptop home and in a fit of desperation, I formatted the external drive in hopes whatever offending file was stopping the backups from completing would be erased. Along with that I also deleted every backup of my laptop that I'd ever made. This put me in the spot of not having a backup and not being able to complete a backup because Spotlight couldn't complete indexing. I removed every unnecessary directory from the backup list, and pared down the list of things Spotlight should index. Still no dice. I happend to be in the office and a co-worker loaned me his external SSD drive to try as an alternate backup destination to see if it was a problem with my external drive. The backup still hung at the 2GB point. My console reported zillions of mdworker: (Warning) Import: bad path: entries. Internet searches weren't shedding much light on what the issue might be. Several blog posts said people had issues with old iPods being connected to their laptops & the exFAT format of the iPod was making Spotlight hang. I also came across a post from Stephen Foskett about exFAT causing problems. This got me to thinking. The only other thing connected to my laptop was a SanDisk Ultra 64GB MicroSD card in a Nifty drive adapter. I don't remember formatting it as exFAT and it's been in my laptop for over a year. I ejected the Nifty card and immediately noticed that Spotlight had a *real* estimate of completion time and that the backup I manually started quickly surpassed the 2GB point where it had previously been choking. The problem I have with this being the fix is this: the Nifty/SanDisk card was present in the list of items to exclude from backing up. Even if Spotlight had problems with the exFAT format of the SanDisk card, it shouldn't have caused the backup to hang. 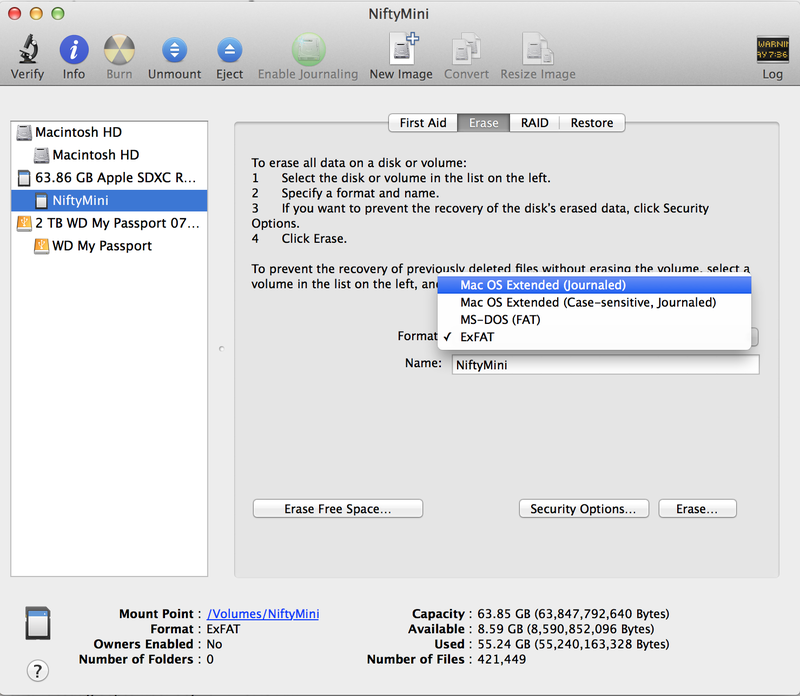 In short, Macs running Mavericks do not play nice with drives formatted in exFAT. Once the SD card was formatted as anything other than exFAT, my incremental backups are completing with no issues.